They’re harder to find this year. But does that mean the committee did a better job? Oklahoma is the only lower seed favored to win its first-round matchup. In filling out the men’s NCAA Tournament bracket this year, you might have noticed that fewer obvious upsets are popping up than in previous seasons. According to the FiveThirtyEight March Madness model, only one game in the first round — No. 9 Oklahoma vs. No. 8 Ole Miss in the South region — features the worse-seeded team as an outright favorite (at 53 percent), compared with three such upset picks last season, two in 2017 and a whopping six in 2016. At the same time, truly promising Cinderellas are more difficult to identify in this year’s bracket as well, with the most probable double-digit seeds to make the Final Four being major-conference members Florida (No. 10 in the West region) and Ohio State (No. 11 in the Midwest). Did the committee get things weirdly right this year? And for bracket-pickers, is that even a good thing? Certainly the seeds this year more closely follow what the statistics would recommend. The Spearman rank correlation coefficient between a team’s overall seed (according to the selection committee’s list) and its place in our Elo rankings is 0.941 this season, higher than in the 2018 (0.926), 2017 (0.912) and 2016 (0.893) tournaments. One reason for the lack of instant upset picks is that the committee appears to have done a better job seeding this year — even if Tom Izzo and Michigan State fans might feel differently. Relative to the field, this year’s No. 1 seeds are basically the same level of strength as usual. But a much stronger crop of teams on the next six seed lines naturally makes it harder to find good upset picks, particularly in the early rounds. One very interesting component of that, however, is that it hasn’t been caused by seeding more power-conference schools in the top half of each region’s seeds. If anything, the opposite is true: Headlined by tiny Wofford as the No. 7 seed in the Midwest and Buffalo as the No. 6 in the West, small-conference schools were acknowledged by the committee as much as ever. Since 2010, there hasn’t been a season where more teams outside of major conferences1 got top-seven seeds in the tournament than in 2019. (Plus, the Ohio Valley managed to get two teams into the tournament — Belmont and Murray State.) 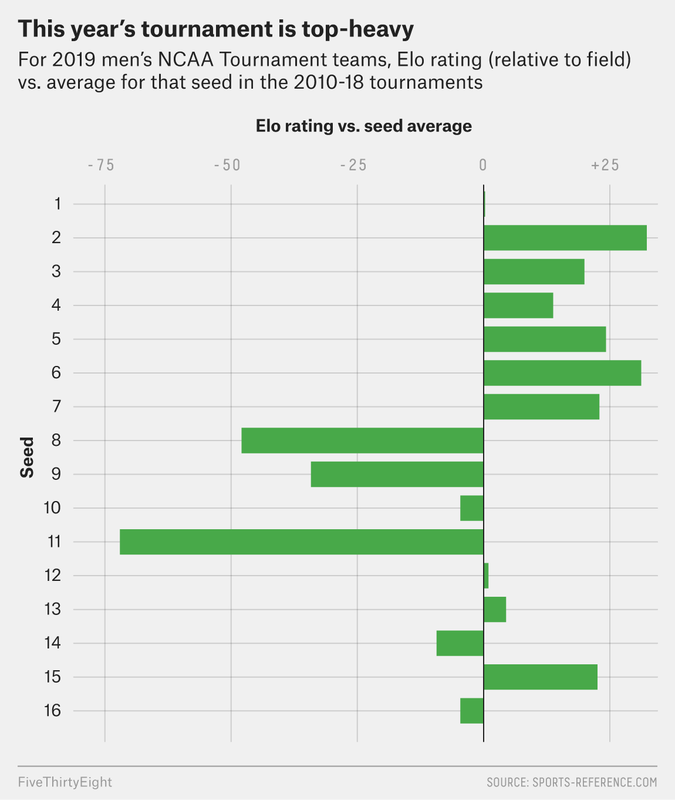 At the same time, major-conference schools are getting an abnormal number of bad seeds: Using the same definition as above, 11 different major-conference teams have double-digit seeds this season, tying 2012 for the most in any tournament since 2010. All of this paints a picture of college basketball’s changing landscape, with better mid-major schools getting more credit for their accomplishments, leading to a better bracket overall. The only hitch in this development might just be for fans of interesting tournament-pool picks. Nonchalky brackets are inherently more fun than ones in which the better-seeded teams are constantly picked to win, and choosing against chalk requires finding inefficiencies in the committee’s original seeds. Better seed choices cut down on those possibilities, making “fun” brackets more risky and chalky ones more likely to win pools. So in some ways, we as bracket-pickers should want a return to the era of worse seedings, to make upsets easier to spot (or at least more tempting to pick). Maybe the selection committee’s better seeds were a one-off this year. Its new “NET” rankings have come under heavy fire, even as the NCAA has tried to modernize and replace the old ratings percentage index (RPI) as its chief statistical guideline for ranking teams. But maybe the improved seedings are a sign of an improved selection process, whatever the reason behind it. (For instance, the committee also appeared to reward regular-season performance over conference tournaments in several cases, which would tend to favor teams that have proved themselves better over a larger sample of games.) Either way, this year’s bracket has made it tougher to pick upsets — and whether that’s a good or bad thing depends on your perspective as a fan. Defined as we’ve done before — teams from conferences with fewer than 100 all-time NCAA tournament appearances.